GDPR has meant that more and more companies demand company files being physically stored in Europe and in some cases even in Sweden. With the new US law, “Cloud Act”, it is also crucial for Swedish companies which supplier to choose to avoid the possibility of foreign authorities getting access to stored information. Therefore, Cygate (a part of Telia), now offers its customers Storegate’s services as part of their offering of local cloud services. When the EU Data Protection Regulation came into force earlier this year, many companies and organizations got their eyes on how their information was handled. This also increased the need for locally produced cloud services for data storage within the borders of Sweden. 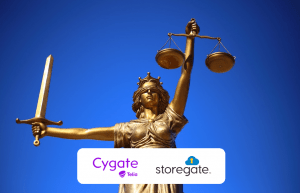 Therefore, Cygate now offers their own and Telia’s corporate customers secure storage in Storegate’s Swedish cloud service. “Today there is a great demand for a legally accurate and secure management of business data. Here, Cygate has already been able to offer a wide range of services as well as custom data halls for storing and managing our customers’ information in a more tailored way. With Storegate, we can also offer Swedish cloud services to secure, store and share files to those customers who make these demands.” Says Patrik Holmqvist, Business Area Manager for Hybrid IT at Cygate. “With Storegate, Cygate’s customers have access to a Swedish cloud service for storing, sharing, accessing and collaborating with files, which is quite unique,” says Matz Karlsson, CEO of Storegate AB. This is because Storegate develops their services on their own platform and therefore as a Swedish company under Swedish law. In addition, all files are stored in our own servers located in computer halls located in Sweden with our partner Telia Carrier. Having our own platform also means that we can offer custom cloud services to secure, store and share files. That’s rather unique as well, Matz Karlsson finishes. Cygate is a Swedish IT company with strength and flexibility. Thanks to our long experience, our personal commitment and not least our passion for everything spelled IT, you are safe with us. We are part of Telia, and on Sweden’s largest network, we can offer local and tailor-made IT services with both width and tip to help you realize your ideas. Our 750 employees in 20 locations in Sweden make it possible. On March 23, 2018, a new US law entered into force, the CLOUD Act (Clarifying Overseas Use of Data), which provides US authorities with access to data stored on US cloud services, even though it is stored abroad, and that US cloud services do not may refuse to provide such data.